So you’ve been paying ReachLocal thousands of dollars for the past couple years and you’re starting to ask yourself – is it worth it? This article will explain exactly why should stop giving your money to ReachLocal for mediocre results, and how you can cut your costs and achieve real growth with us. You don’t own that website you’re paying for. That website you’re paying $1000 a month for? Yeah, you’re just renting it from them. The only part of your “Reachsite” that you own is the content that you provide for them. The less than average template based website that you are paying for is solely owned by ReachLocal. If at any time during your contract with them you decide to cancel your membership, they disable everything and leave your company back at square one. How would you like it if that $30,000 routing machine that you’ve been paying off for two years was never going to be yours? What about all your work trucks? I think you see where I’m going with this. When you buy a website from us, you own it – permanently. What a concept right? Not to mention that the website we create is totally custom, and actually looks like it was made utilizing current design and SEO best practices, not some generic template that 100’s of other companies are using. Their pricing is WAY too high. You’re probably really great at finding the best vendors for your fencing company. I’m sure you’ve gone through many bad vendors and have eventually settled on the ones with the most reasonable prices and the best service. So why should your internet marketing vendor be any different? ReachLocal’s prices are absolutely ridiculous. 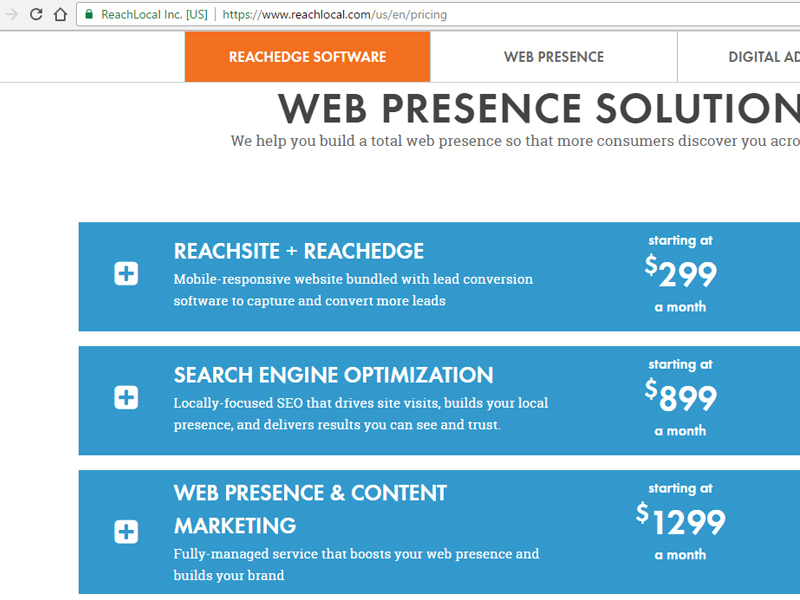 Let’s take a look at their pricing structure for SEO and “Web Presence” – whatever that means. These two services are the backbone of any search engine optimization campaign – and combined, they START at $2198 per month! There are three PVC fencing vendors in your service area. The first one sells privacy fence at $13.00 a linear foot. The second one sells privacy fence at $10.00 a linear foot but has worse service. The third is Home Depot – they sell their garbage tier privacy fence at $22.00 a linear foot, charge $75 for delivery and you have to assemble everything with Chinese brackets and hundreds of screws. What contractor in their right mind ever buy from Home Depot? They’ve ripped off a lot of people. Do yourself a favor and read through this page full of pissed off customers. Now, it’s a given that any business, whether good or bad, will get some negative reviews over time. But these are just criminal. Former customers speak on how they’ve given large amounts of money for Google Adwords campaigns, only to have 50% or more of their budget pocketed as profit and the remainder used on unremarkable campaigns that barely rank in the top three spots. Real internet marketing companies are totally transparent about account setup and management fees when you set your advertising budget a maximum of 10%-20% that budget goes to pay the ad agency, not 50%-60%. Stop paying too much money for a bad product. You’ve worked too hard to build your fencing business from the ground up. When you’re making 30% or less in order to beat out your competitors, you need to make every dollar of your advertising budget count. Shelling out thousands of dollars of your hard-earned profits a month to a mediocre internet marketing company just doesn’t make sense. Show us your ReachLocal monthly bill then watch us cut it in half and give you twice the results. I mean 50% of the cost, 200% results? It’s really a no-brainer.